Riding the Waves: A friend is always there to bail you out of jail. A best friend is right there in the cell next to you, saying, "Dude, that was AWESOME!" A friend is always there to bail you out of jail. A best friend is right there in the cell next to you, saying, "Dude, that was AWESOME!" No, I did not go to jail this weekend. I just liked the quote. There are a couple things to talk about today. First, the cleanse. It went great Thursday, Friday and most of Saturday. However, Saturday night and Sunday was declared cleanse-free. It was a joint decision by Jenna and me. Back to the cleanse Wednesday (after my birthday). Now for the fun part: the weekend! It. Was. AWESOME. Best weekend I’ve had in a long time. 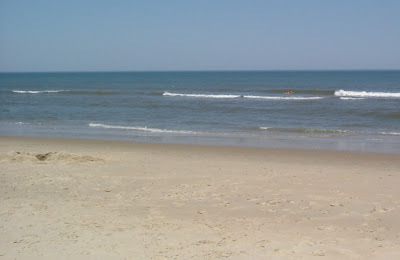 Basically, the people I was going to the beach with from here in NC were annoying me, in the sense that they kept changing plans, when we were leaving, whether or not we were even going to the beach, etc. By the time the trip was officially “on” (for about the 5th time) I had pretty much checked out. The NC group left Friday night to head to the beach. Rather than join them, I texted Jenna first thing Saturday morning and asked her if she wanted to hang out at the beach all weekend. She said heck yes. I said I’ll be there in less than 4 hours. I packed my swim suit(s) and hit the road. We were on the beach later that afternoon! We hit the beach Saturday with Sarah, a friend of Jenna’s who is hilar and so much fun. Then we all went out Saturday night. (There are SO many stories about it that I can’t even get started on them.) Sunday was more beach time. The weather was perfect—90 degrees and cloudless. Jenna and I even braved the water. I think braved might be an understatement. It was the COLDEST water I’ve ever felt in my life. I imagine it was about the same temperature as the water the Titanic went down in. Our feet were numb from it, but it was invigorating. To go in we had to get a running start from the beach—there was no “easing” into this hypothermic water. Sarah tried to take some pictures of us running—Baywatch style—into the ice water. See below. Oh, did I say “best” pickup line? I meant WORST EVER. But funny. It looks so serene and innocent, but don't buy it! Brrrrrrr!! This is what happens when a spider tries to mess with me: he gets trapped in a straw with sand at both ends. HA! Here we are, running into the waves Baywatch-style! There's a reason we're the only ones in the water. It's called hypothermia. So. Jealous. But I want more pictures of your face! YOU rock crazo. I was really nervous to scroll down and see 1461 or 2 there if you know what I mean. But you wouldn't do that cause you know I'd m***** your a**. Love, EOD - do you know what that is?! No, YOU rock BeFri. And no, I don't follow you when you say "EOD"--what does that mean? You haven't told me enough times yet. Hahaha! P.S. 1461 and 1462 have. Been. DESTROYED. No one should ever be subjected. And you know what I'm referring to.